It's impossible to choose between whether Chris Christie and his staff are liars or are incompetent -- they're both. Of course, Christie has a history of sending teachers letters where he flat-out lies to our faces: back in 2009, during his first campaign, he told us: "I will protect your pensions. Nothing about your pension is going to change when I am governor." But the first chance he got, he jacked up our contributions, gutted cost-of-living increases, made us pay much more for our health care without the benefit of negotiation, refused to follow his own law and make the pension payments he said he would make. To make things worse, he then said he had no idea the pension problem was as bad as it was, even though literally everyone who had the slightest interest in the topic knew New Jersey's pensions were headed for disaster. It's incredible a man who ran for governor during the Great Recession would claim he had no clue the pensions were a serious problem for the state. Again: Chris Christie's not just a liar, and he's not just incompetent. He's both. Which brings us to his latest, utterly ridiculous letter. How many ways is Christie and whoever wrote this completely lying and/or clueless? - Christie says the New Jersey Education Association (the state's largest teachers union) has acted "irresponsibly" toward its members. But his own letter shows NJEA members pay less, on average, for health care than other local public employees! 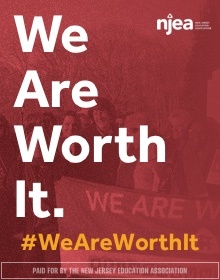 Teacher's Average Premium Cost with a 9% Increase: $8,171 Per Year. Local Government Average Premium Cost with a 6% Increase: $9,967 Per Year. 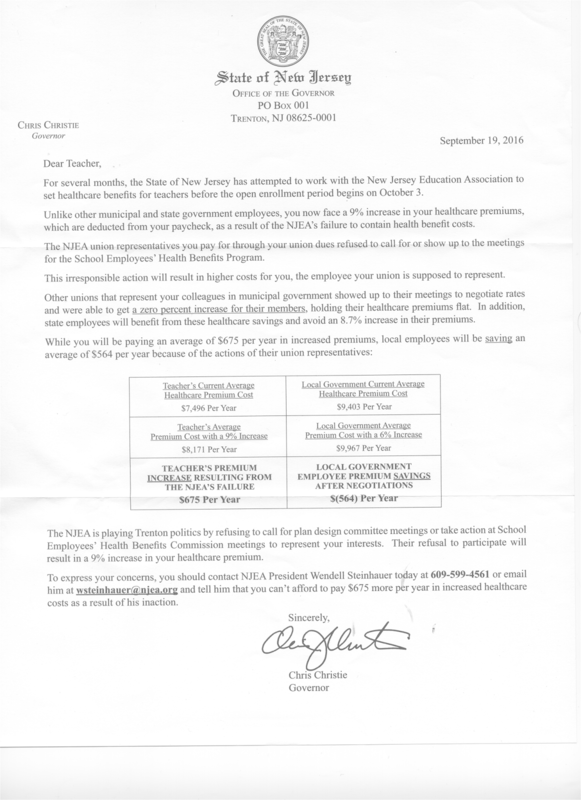 If I was not an NJEA member and worked for a local government, I'd be wondering why the teachers are getting such a good deal on their health care! - Christie says other unions got a "zero percent increase for their members." But his own chart in the letter shows a 6 percent increase! So which is it? Does he know? Does he care? - The chart shows the difference in before and after premiums as an increase for NJEA members but a decrease for local government employees -- even though both premiums went up! Does anyone proofread this stuff? How does this make any sense? - There is no indication of how Christie calculated the "average" premium cost. I'm not sure a point estimate means anything in this context: there are just too many individual variables. How did they get this number? - As NJEA has explained, the union's protest has nothing to do with current benefits; it's over retiree benefits. NJEA President Wendell Steinhauer has released a statement that gets into the nitty-gritty, so I won't rehash it here. The basic issue is that the teachers unions are supposed to have 4 representatives on the State Education Health Benefits Commission: 3 from NJEA, 1 from the American Federation of Teachers (the union that represents Newark and a handful of other NJ districts). Last year, Newark Teachers Union (the local AFT affiliate) president Joe DelGrosso passed away (he was a great fighter for teachers in this state). Christie has not allowed AFT to put a replacement on the commission, which gives him a voting advantage, which he has abused by trying to push through changes to retiree benefits. 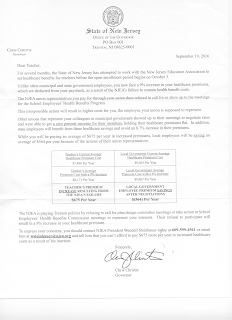 The upshot is that NJEA's refusal to play Christie's game has nothing to do with the increase -- which still leaves NJEA members, according to Christie's letter itself, paying less for health benefits than other local employees! I'll admit I'm pretty miffed that Christie is trying to drive a wedge between NJEA and its members. But what really galls me -- and ought to piss off every taxpayer in the state -- is that he's abusing his position to do it. It's simply outrageous that such a nakedly political document, targeting a public employee union, carries the seal of the state and arrived in our mailboxes on the taxpayers' dime. If I have any advice for my fellow teachers, it's this: don't fall for any more cons from the worst governor in this state's modern history. The incoherence of this letter alone is enough evidence to disqualify anything Christie has to say to those of us who work in New Jersey's classrooms every day. But if anyone needs any more reason, look no further than Christie's history of blatant lying to public employees. "If we've learned one thing after seven years, it's that Chris Christie has a hard time telling the truth in letters." Shut up! How dare you question my letter, even if it makes absolutely no sense! I'm the governor -- well, for now anyway. Just shut up and do what you're told!